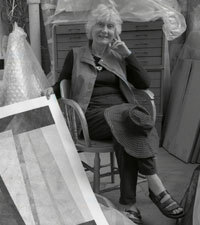 Ruth Bercaw graduated with a BFA in 1959 from Washington University in St. Louis and later received her MFA from Kent State University. In 1990, she was the recipient of the Ohio Arts Council Individual Artist Fellowship Grant. Her commitment to bold ideas produces fresh looking forms, thus her paintings become explorations of the human spirit. Bercaw describes her creation process as, “The concepts which currently interest me revolve around subjects associated with the environment as well as complex relationships (human or non-human) experienced over time and space. My chose vehicle for conveying these ideas is a limited selection of simple three-dimensional shapes, and an unlimited selection of colors. Use of chance enters into many of my compositions, where in color sketches I juxtapose segments of seemingly unrelated shapes and hues. In this process, I look for the unexpected while still holding out for combinations that have potential for beautiful development, contexts that exhibit uniqueness and strength, ones that excite and challenge the mind.” As an active Cleveland artist her contributions to the art community are considerable. She has exhibited extensively in Ohio, particularly Cleveland and Columbus, and is represented in numerous collections including the Ritz Carlton (Cleveland), the Museo d’Arte Contemporanea (Spoleto, Italy), The Cleveland Clinic (Naples, Florida), among many others.